As government by the people, democracy has always had its proponents as well as opponents. What forms of government have Jewish leaders, both with and without actual political power, favored? Not surprisingly, many options have been offered theoretically and in practice. Perhaps more surprisingly, democracy has been at the heart of most systems of governance. Biblical Israel was largely a monarchy, but many writers of the Bible were critical of the excesses that almost always arise when human kings take charge: the general populace loses its freedom. In rabbinic Judaism, the majority ruled, and many principles that support modern democratic institutions have their basis in interpretations offered by the classical rabbis. This is true even though rabbinic Jews did not govern democratically. When Jews did have some degree of self-governance, democratic principles and institutions were often upheld. At the same time, so most communal leaders insisted, God—the ultimate judge—ultimately judges everything and everyone. Modern Israel provides the first instance of an independent Jewish nation since the Hasmonean monarchy of the second and first centuries BCE. On an almost daily basis, common features uniting democracy and Judaism, as well as flash point of controversy, are highlighted there. 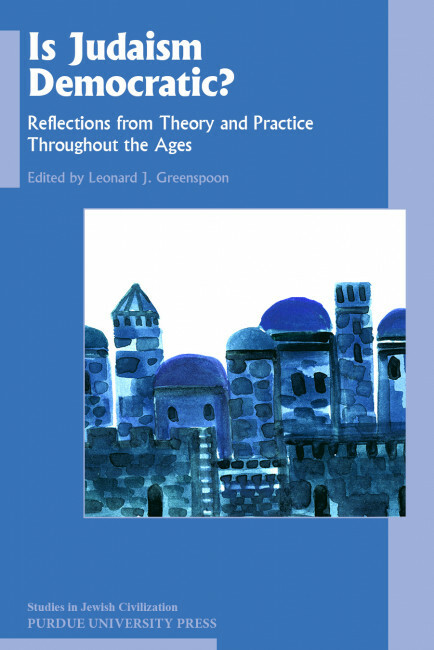 Leonard J. Greenspoon holds the Klutznick Chair in Jewish Civilization at Creighton University, where he also is a professor of Classical and Near Eastern Studies and of theology. Prior to his tenure at Creighton, Greenspoon was a professor of religion at Clemson University. 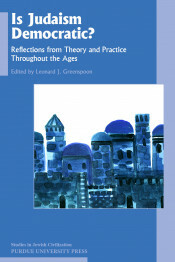 As well as editing the Studies in Jewish Civilization series, Greenspoon has coedited another four volumes and written four monographs. A prolific author, he has written over two hundred journal articles, book chapters, and major encyclopedia entries. He has made public and scholarly presentations throughout the United States and Canada as well as in Israel and many European countries. His major research interests center on Bible translations (especially Jewish versions) and religion in popular culture.